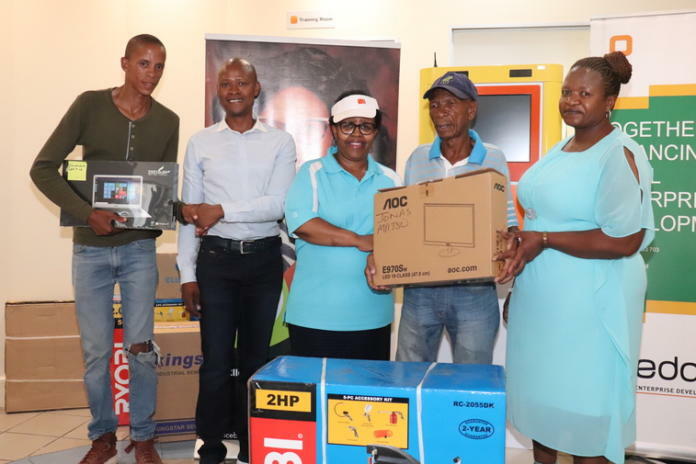 During the handover of equipment to entrepreneurs were from the left small business owner, Itumeleng Pile, manager of the Seda’s Mangaung branch, Andrew Setho, provincial manager, Jackie Ntshingila, small business owner, Jonas Mpitso and Nthabiseng Jonas from the Mangaung Metro Municipality. The Small Enterprise Development Agency (Seda) in Bloemfontein, together with the Mangaung Metro Municipality and Small Business Ministries, handed over equipment to help small businesses in the area in December. The provincial manager of Seda, Jackie Ntshingila, told Bloemfontein Courant that this initiative is taking place all over the country. The equipment included items such as TVs, refrigerators and sewing machines. Ntsingila said that there are processes within Seda, which include small business owners coming for a business plan and training.